You may have heard, but the United States is going through a difficult decision this year. There are two political sides vying for control, each with their own candidates and ideals. Some put up an honorable front; some use vile deceit to achieve their goals. But one side MUST be chosen. Yes, that’s right–! 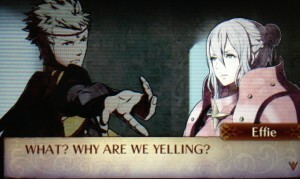 The new Fire Emblem games are out! What? As if you NEEDED more Trump jokes. Anyway, there are two versions you can buy: Fire Emblem Fates: Conquest and Fire Emblem Fates: Birthright. 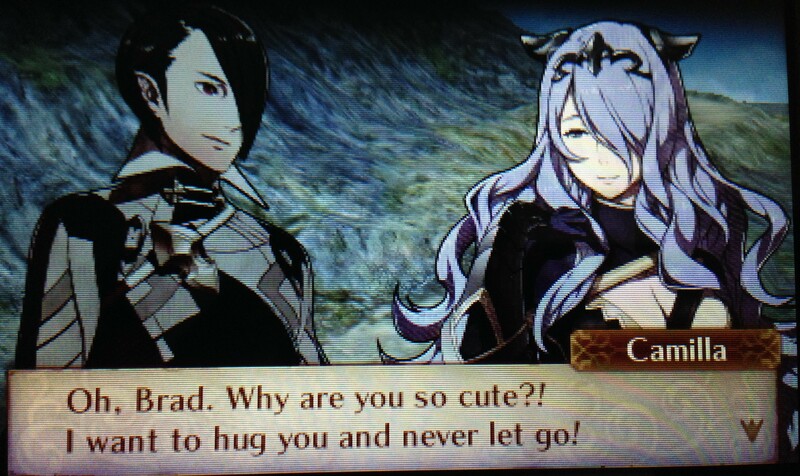 In both games you design a lead character that starts out in the nation of Nohr. That’s them on the left. They raise you as their own family, keeping you locked away in a castle. But zounds, it turns out you were kidnapped as a child: The guys on the right, the Hoshidans, are your TRUE blood relatives! What to do? These mighty nations are at war, and BOTH want you to join their cause. The first five stages let you sample each side of the conflict and then, THEN you must choose who to align yourself with. I didn’t really know all of that before I went into Gamestop, though. I just made the cashier show me the boxes and I picked the cool guys in dark armor. I still had to make the choice I spoke of earlier, however. The other faction’s side is available as DLC if you own either physical game. And at half price, too. Very nice. Alright, now for the actual gameplay. I’ve heard that Conquest is the tougher of the two, and what I’ve seen so far is quite difficult. 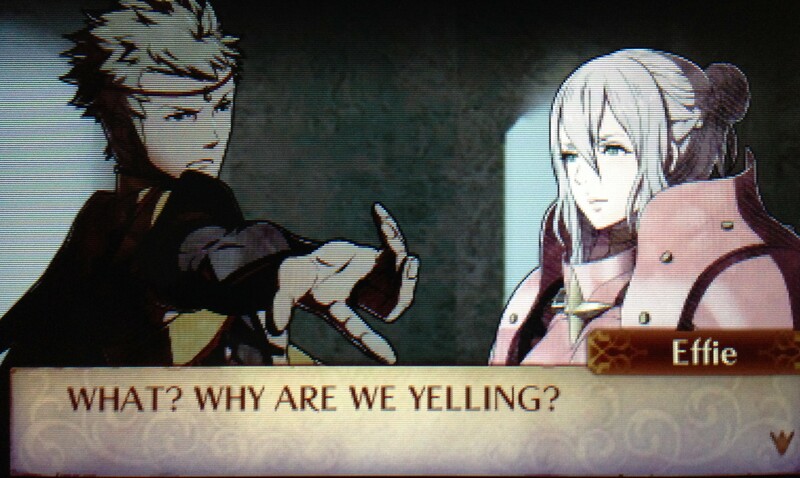 However, these levels are without a doubt the most entertaining levels I’ve seen in a Fire Emblem game. The previous game, Awakening, had two big problems: all the enemies on the map would just rush you, and the reinforcements would appear from nowhere and rush you on the TURN THEY APPEARED. What a crock. Fates brings things back to how they used to be: some enemies chase you, some stand guard, and the reinforcements give you a turn to react before they start running around. Not to say this is all easy, however. The reinforcements ARE timed for maximum pressure. Did you just engage the boss? They’ll pop out of the nearby stairs. And most levels have effects that either you or the enemies can trigger. Freeze a lake. Flatten a wall. Use wind to blow entire armies all over the place. And if you think you’ll be able to creep forward in formation at leisure, think again: some of the missions are timed. “Beat the bosses in 20 turns” sounds like long enough to do what you want, but in the end I was pulling out all the stops just to get the final hits in on the paired up generals. It’s hectic and awesome. And yes I’m playing on the mode where any unit death is permanent. You can play with “rez mode” turned on, however, so go ahead and do that if you want. There is something else you need to know: There is way more “sim” crap in this game. You can make a main base. Build shops and statues. You can get married. You can make a little treehouse where your spouse will show up on the bottom screen and kiss you from your character’s point of view. Most of the sim stuff is optional, though. I only married off my main character for the support stats: everyone else is single. I mean, it’s not like I care about that nonsense. Just get me into the next thrilling battle, am I right? I certainly don’t fantasize about buxom women ogling my avatar. Ha,ha,ha. Enjoy the chapter. I have to go, uh, fight more battles. Mean was face-down upon the quiet, glass plain. Her breath tossed the strands of stray hair near her lips. Her eyes were closed. Behind her, Shirka’s eye was open. She slammed a hand on the glass, lifting her body upright with a trembling arm. Her ears buzzed. She lurched as she stood above Mean’s unconscious body. “You almost killed me,” she said. Her lips were blue and she gagged as she spoke. A revolver pistol appeared in her hand. She pointed it down at Mean’s head and pulled the trigger; her finger swished through it and her knuckles closed around the grip, passing through. She gazed out at the idling tanks; up at the zeppelins, stabilizing their positions. Her eye fell on the tower, and the large gashes torn out of the sides. She gagged again. She marched toward the chandelier, the ring in her hands and the leather bands swinging. “I’m sure Mean can handle her from here,” Dark chimed in. Cougo twirled his spring-shaped focus between his large fingers. “They kind of implied it after you two left,” Trisk said. Dark nodded at her. He headed over to the mismatched hexagonal area along with Trisk, Vornis, and Darrow. Something high above them creaked, resonating throughout the large room. Dark’s group vanished from the door and arrived on the plain beneath the chandelier’s base. “Not sure if we should just leave them all by themselves,” Vornis growled as they stepped away from the treaded plate marking the connecting door. “I don’t think we can fix this mess anyway,” Trisk said. They stared out in every direction: at the ruined husk of the Nameless; at the haze of gas obscuring Pladomir’s factory. “Calm down; someone’s coming from that way,” Trisk said. She pointed out at the tanks and smoke drifting away from a single, concentrated spot. Beebee appeared at the nearby hexdoor with Calm in her arms, followed by Pladomir, Slaberdashia, Clance, Sain, and Cougo. “You just told us to leave with the hexdoor,” Trisk said. Cougo spoke up, stepping backwards away from the group. “Actually, I’m the one that told you to leave,” he admitted. He held his spring focus in his fingers along with Clance’s pin and Pladomir’s token. “What! ?” Pladomir uttered. He patted at the pockets on his suit. “Cougo we don’t have time for this!” Sain barked. “Did you forget when I can do when I’m not wearing it?” Elder Sain said. “No, but you will!” Cougo laughed. He held out his fist toward Elder. The tapping of quick footsteps sounded nearby. The ring was in her hand and she crammed the whole thing into Cougo’s large mouth. Her tiny forearm thrust past his flat teeth to his throat and was out again, leaving the leather cords dangling from his lips. She held the resizing tool in her other hand and she stuck it on the leather as he hacked and sputtered. “Shirka don’t do it!” Elder cried, galloping at her. Shirka twisted the key; Cougo’s eyes crossed and the neck of his sweater bulged. The leather expanded and Beebee looked away, hearing a wet snapping noise. “Cougo!” Clance cried. Elder tackled Shirka, knocking her off Cougo’s body. Vornis cried out and he clutched at the grey wisps of hair on his head. The others expressed similar signs of shock as memories and experiences flooded back into their minds. Calm awoke in Beebee’s arms, screaming. From her point of view the woman was tiny: a small speck standing inside a small room. “Zonzabee” is what entered her mind as she looked down, far down at the woman staring back up through the tiny window. “Ah! That did it!” Zonzabee cried. She placed an object into a slot on the chest piece she wore, joining many others that all fit into their own fashioned places. “Marvelous! Glorious! How beautiful!” she went on, staring up, far up, through the window. She could see other things around her too: tall towers lined with metal arms that bore instruments, chains, and hooks. Two massive, clear tubes lead up from somewhere, terminating at spots just below her range of vision. Colored gasses flowed through them. Zonzabee continued to exclaim. “Where am I?” came a voice, slurred. Zonzabee tapped one of the winged hairpins holding her hair up in crown-like spires. “But I see other planets,” she replied through a wet slur. Zonzabee took a small orb from her garment and whipped it between her two hands at great speed, catching it and flinging across again. The tubes are now gone and the colored gasses were spread about her in a vast cloud. Zonzabee stood in the tiny, windowed room along with another person. “Wow. She’s really big,” the young teen said. His dark skin contrasted with the white garment he wore. “Who is that?” she asked, her voice loud and free of obstruction. “I thought I was supposed to be your only one,” she says. The clouds of gas sway from her breath. A new one stood next to Zonzabee now, along with a grown Elder Sain. A young woman dressed in white, with large hips filling out the clothes. A booming chuckle resonated. Zonzabee grinned. A flat, glass ceiling now blocks off the sky. The gas is condensed, stifling. “I don’t want to work for you anymore,” she expressed, and a shadow was cast over the small room in the floor. Pladomir trembled, yet his stance remained firm as he stared back through the window. A thin tube now extended from the small room all the way to the overbearing ceiling. “They’re just flying,” she replied with a low chuckle. “Who’s there with you now?” she asks. A tall man with blond hair stood behind Zonzabee. Clance fidgeted. Zonzabee sighed. She removed one of the winged hairpins from her elaborate hairstyle. A single spire uncurled. There were three new people inside the little room this time: a child restrained on a slab, a blond teen, and a large, hair-covered woman. In the area far past the room many pieces of the glass ceiling had fallen. They were warped and blackened. “Well,” Zonzabee began. “I’m sorry it’s come to this. I did not think you would disobey me this much. After all of my patience. Even when I went through such lengths to accommodate you.” She removed a lens from her suit and held it to her eye, peering far up through the window. “Reckless destruction upon the planets and my beautiful chandelier. Catastrophic data loss on the drive.” She lowered the lens and replaced it. “What are you doing to me this time! ?” her voice roared down. Slaberdashia shrunk back. There was an inhuman wail from above. Zonzabee nodded. The wailing rose to a furious howl. The colored mists above the room churned. A crash shook the room; the pieces of glass in the distance bounced. Slaberdashia wobbled; Zonzabee caught Cougo with one arm before he fell over. Cougo’s body was still, his eyes open and a dark pool spilling out beneath his neck. Shirka was pinned, laughing. The enlarged ring in her hand was bloody. Elder Sain removed the resizing device from the leather and tossed it away. “Cougo!” Clance wailed. He knelt next to the body, placing his hand on his chest. “Elder!” Beebee shouted. “It’s Calm! She’s acting strange!” Elder Sain glanced over at Calm’s limp body. From somewhere far below the glass a deep and echoing sigh resounded. “No, no, no, no,” Slaberdashia repeated. She covered her ears, muttering to herself. “What was that?” Trisk asked, grabbing onto Darrow. Darrow grabbed back. “I don’t know man but I think I’m ready to leave. Vornis? Dark?” He peered around: Vornis was staring off into space; Dark was on his way across the plain to where Mean was staggering toward them. “Dark, is that you?” she asked. He helped her walk with a steady arm linked to hers as they made their way back to the others. “I think we’ve got more problems,” Darrow said. Trisk pushed her way past him, bending down to look into Mean’s eyes. “Where did Mackaba go?” Mean asked. Dark let out an exasperated sigh. Her final word ended with a squeal as hollow voice rang from below, shaking the glass at her feet. She slapped her heart with her hand. “I SAID WHAT DID YOU DO TO ME! ?” came the reply as the clouds below the glass churned. Slaberdashia shuffled her feet, lifting one and putting down the other. “She should still be bound, right, Elder?” Beebee asked. Pladomir was staring into space, his glowing skin almost white. He jerked into awareness again. A long, scraping noise like gravel on glass came from below. “ZONZABEE! WHERE ARE YOU! ?” the voice roared. “Can you carry her?” Beebee told Slaberdashia. She handed Calm over as the rest of the group made for the boats: Elder leading the way with Shirka in tow as Pladomir tugged Clance away from Cougo’s body. “Vornis, you all right?” Mean asked as they walked. Vornis shook his head. “And I’m suddenly remembering thirty conversations we had with him back in that ship,” Darrow sighed. “Well whatever is down there just remembered something too,” Mean said. They reached the pair of inflated lifeboats, with the sibling already gathering around one. Slaberdashia was pulling Blann out it with her free arm. Blann’s brow crinkled, and the three horizontal glowing stripes there wrinkled as well. He trotted over to the lifeboat that Mean’s group was boarding. “You heard our plan all the way across the room?” Trisk said. “Well get ready to rely on it too because we sure aren’t driving this thing to your world,” Trisk shot back. Brann frowned. They watched as the other lifeboat inflated and lifted off on the starboard side. The glowing patterns of the factory smokestacks were flashing off the bow with a massive blimp with red markings positioned above them. “Something’s wrong on their boat,” Darrow said. Blann kept his focus ahead as the others turned to see Elder Sain and the other sibling’s shouting something at Pladomir, who was driving. Their ship began to swing around. “Wait, where is the girl with the cowboy hat? Beebee?” Mean asked. “Did she not get aboard?” Dark said. “She didn’t stay down there, did she?” Mean stood as the boat moved forward through the air. She peered over the side. “Dark!” she shrieked, stumbling backward and into his arms. “What!? Is she still down there?” he said. He steadied her and leaned over to look at the glass plain below. He could not see her; a large mass was rising from somewhere beneath the clouds and the glass. It came into view near the wrecked blimp, a face at least as large as it was. Two eyes blinked as it flinched away from the glass. There was a shut eye where the creature’s nose should have been, as if two heads and two faces had been conjoined at that spot, twisting outward with two separate jaws jutting out at opposing angles. The skin was cracked; caked with streaks of orange and yellow. A link of chain pierced the skin above each of the two open eyes. The body beneath the neck was concealed by the haze. Nobody on the boat moved. The mouth on the right yawned open. The currents of colored gasses converged toward its lips as it drew in a single, continuous breath. As it inhaled the jaw on the left snapped ajar, spewing a solid red vapor as it spoke. It might be tough to determine what happened during Shirka’s assault on Cougo; I tried to avoid being too graphic. First, Shirka shoves her ring into Cougo’s throat. There’s quite a difference in size between her and Cougo so she can do that. Then she uses the resizing tool to expand the leather strap attached to the ring, which also expands the ring inside his throat. Then it bursts through his neck. See? That’s so horrifying! Why would I type that out. The method was necessary though. As you’ve seen, these guys are tougher to kill than a normal person. And since Shirka has been drained of her powers she has to use the tools that were already established from the other chapters. NECESSARY. I thought about writing this in first person, but decided against it. Do you think it would work better that way? I kept messing up after I made the decision: I kept putting down the verbs in present tense. Shoot–there are probably still some I missed. Calm’s memories are still “shot” from her point of view though; the reader doesn’t get to know what she looks like until the ghastly reveal at the end of the chapter. Or maybe you think she’s cute. I don’t know. But this is the sort of thing I could spend multiple chapters on; letting you see how Zonzabee used the siblings and giving you insight into why they turned out the way they are. However, I DEMAND conciseness! Slaberdashia: ONE SENTENCE! Beebee! You get to say one thing then you STOP. Next sibling! Go! Yeah, I’ll bet you thought the previous chapter was the final fight. Or at least, you were hoping it was. “Does this ever end! ?” you may be thinking. Or you may be shouting it at your screen. Which brings me to our next important discussion: when to use ALL CAPS. You may have noticed, but I have never used ALL CAPS in any of my stories up until now. If someone is shouting, I just put exclamation marks everywhere. You can never have too many of those. But ALL CAPS? That just looks gaudy. When I was typing out the true Calm’s lines, however, normal-sized just didn’t seem right. I mean, this voice is coming from a humongous creature that needs to speak even louder than normal in order to be heard through a massive floor. This entry was posted in First Drafts by Brad Smith. Bookmark the permalink. I need to stop waiting so long between chapters! I wasn’t sure what happened to Cougo at first. I realized she killed him but I didn’t realize how she did it. Thanks. I suppose I’ll have to go with the gruesome splatterific version of events! Your confusion makes it justified.